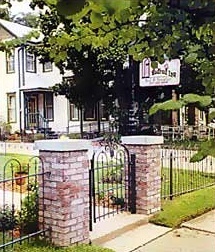 The Heritage Inns Bed and Breakfast Cluster in Denton, Texas offers a variety of amenities for your comfort and pleasure. Each of the three inns is beautifully restored with it's own distinct style and flair. Individual rooms feature queen-sized beds, private baths, telephones, cable TV, and a library. Enjoy a full breakfast with others in the dining room or privately in bed. Spend a relaxing, private hour in the hot tub enclosed in the Redwood gazebo. The Inns are within walking distance to Denton amenities. Need a quick getaway this WEEKEND to unwind and relieve from the busy fall schedule? Take advantage of this special. Call 24 hours of your desired arrival date and we will discount the room rate by 10%. Make it two night stay and we will increase that discount to 15%. Special room rate and room choice is based on availabilty. Call 888-565-6414 to make your reservation and be sure to mention this special. Special cannot be combined with any other special discounts.